Download this paper as a PDF (11 pp., 2.3 MB). Our online article “Local/Global: Mapping Nineteenth-Century London’s Art Market”(1) explores the dialogue between the local and the global art markets that established a distinctive dynamic for the art world as experienced in London. Our analysis derives from two complementary datasets and visualizations. The first is an interactive map plotting the locations of major London commercial art galleries between 1850 and 1914, authored by Pamela Fletcher and David Israel. The second is an analysis by Anne Helmreich, with the assistance of Seth Erickson, of sales data drawn from the stock books of Goupil & Cie and its successor Boussod, Valadon & Cie, which cover transactions at the firm’s various branches located in Paris, London, The Hague, Berlin, Brussels, and New York during the years 1846–1919. The map exists as a stand-alone research resource, hosted by Bowdoin College, whereas the network visualizations were produced solely for the purposes of this research inquiry. We chose to combine these two analytical fields—the geography of the London art market and the social and financial network of a retail firm situated within that landscape—as a first step toward our larger goal of representing—or perhaps more accurately, modeling—the London art market. Our intent was to offer new approaches to the study of the London art world, which we conceptualize as a set of pluralistic and elastic possibilities rather than a market that was rigidly codified by institutional bodies such as the Royal Academy. The article grew out of our collaborative work on the nineteenth-century art market over the past ten years. This work is part of the ongoing revision of the paradigms of the nineteenth-century art market established by Harrison C. White and Cynthia A. White’s ground-breaking study Canvases and Careers: Institutional Change in the French Painting World, first published in 1965. Their pioneering work has been built upon, modified, and challenged in recent decades. Across this scholarship there is a broad consensus on the basic transformations that took place during the period: the relative loss of significance of state-sanctioned academies and the increasing importance of commercial art dealers and galleries. The details and significance of this trajectory, however, are subject to considerable debate. With the exception of the work of Thomas Bayer and John R. Page, scholars of the British art market have generally adopted the case-study approach, using carefully selected examples from which to draw broader conclusions. 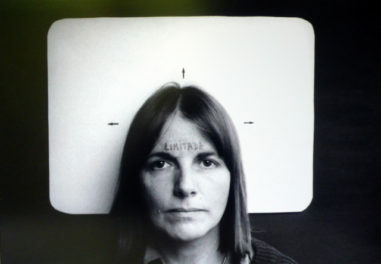 Given the sheer quantities of data involved, drawn from the thousands of exhibition catalogues, auction records, dealers’ stock books, collectors’ inventories, and press accounts that detail the daily workings of the market, case study analyses of individual dealers, artists, galleries, or patrons are a strategic response. Yet some questions cannot be answered—or even posed—without using larger datasets and finding ways to effectively mine and visualize the material they contain. Our two projects—and the article linking them—are our attempts to use these larger datasets and digital and computational methods together in order to better understand the larger cultural field of the nineteenth-century art market. Fletcher’s research project began with a set of questions about the reception of works of art in nineteenth-century London: where did people encounter works of art, and how did the physical and social circumstances of those encounters shape their responses? Understanding the exhibition culture of Victorian London requires accounting for not only the well-documented institutions of the Royal Academy and other artists’ societies, but also the many smaller commercial spaces that sprang up across London’s landscape in the second half of the century and eventually transformed the market for art. Information about these individual galleries is scattered across very different kinds of archives. 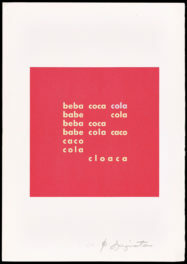 (The current project drew upon four major sources: the extensive collection of nineteenth-century exhibition catalogues at the National Art Library at the Victoria and Albert Museum in London; reviews and advertisements in the periodical press; the exhibition and event listings compiled annually by the journal The Year’s Art; and, to a lesser extent, collections of letters between artists and dealers in the collections of the National Art Library and the Getty Research Institute.) It quickly became clear that a single narrative history of the emergence and consolidation of the gallery system could not contain or account for the sheer quantity of the data and its fragmented nature. We asked ourselves how to achieve this distant view, how to shift from the individual transaction in order to analyze the behavior and history of a network and the strategies embedded within it. To answer these questions, Helmreich turned to the methodology of network analysis. To adopt this methodology requires conceptualizing the market as a triadic relationship between artist, buyer, and art dealer. The transaction—the act of consigning, exchanging, selling, or buying a work of art—forms the links between these agents. The artist sells or consigns the work of art to the art dealer, thus establishing a relationship, and the buyer acquires the work of art (or exchanges one work for another or sells back to the dealer), establishing yet another relationship. 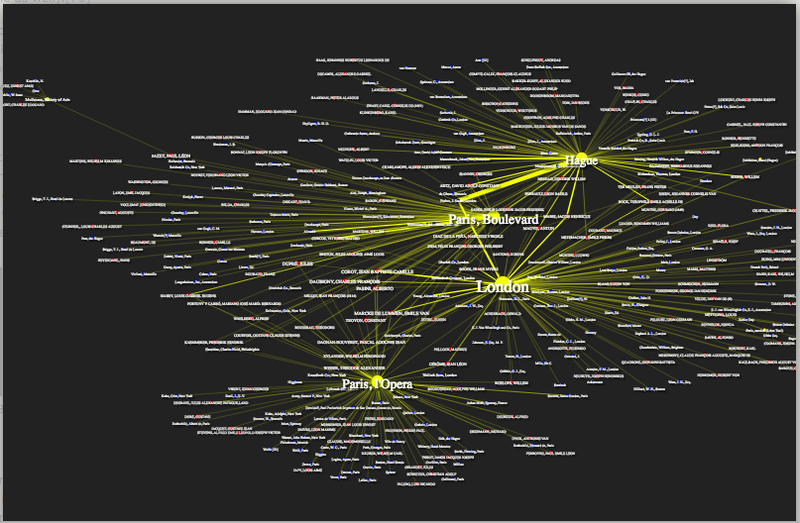 In the language of network analysis, the artist, buyer, and dealer are nodes and the transactions are edges or ties. This methodology revealed a number of invaluable insights, which we discussed in our article, including relationships between artists and patrons and between artists and particular branches within the firm’s corporate network, and the relative significance of branches. Perhaps the most surprising discovery was that the London branch of Goupil outstripped the other branches in transactions in 1883. Significantly, the network analysis could not explain why this happened— the method reveals patterns within the data, but it takes the researcher to interpret the significance of those patterns. The map provided a crucial piece of evidence for answering this question, as it reveals that in 1883 the London branch of Goupil moved to New Bond Street, in the heart of the luxury retail trade. These visualizations of spatial and network analyses demonstrate that local and global markets are not really bounded or distinct, but rather are made up of different sets of overlapping and intersecting networks that artists accessed and activated in different ways. 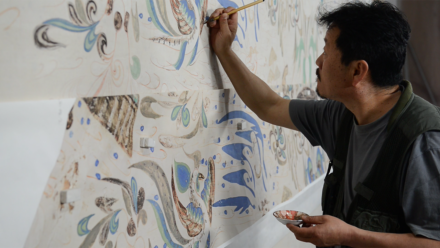 These possibilities both opened up the market—meaning there were multiple pathways for artistic success as measured in commercial terms—and also exerted pressure on artists seeking to steer a course through this dense and rapidly changing landscape. The process of making a scholarly argument using digital humanities methods is a relatively new one for art historians. Therefore, as part of our article, we provided narratives describing how our projects developed, as well as lessons learned that could benefit the broader field. (7) Below are modified excerpts from this section of our article; for a fuller account, please see 19thc-artworldwide.org/autumn12/fletcher-helmreich-mapping-the-london-art-market. The Map (Pamela Fletcher): We chose to use ERSI’s ArcGIS for pragmatic reasons: in the 1990s and 2000s, GIS was increasingly visible in historical scholarship and there was thus available funding and technical support for humanities scholars to use it. In the summer of 2005, David Israel, Bowdoin student Karen Fossum, and I received a grant from the National Institute for Technology in Liberal Education (NITLE) to attend a “GIS at NITLE Student Immersion/Faculty Focus workshop” at Middlebury College, which was led by Diana Stinton. The Gibbons Summer Research Internship Fund at Bowdoin sponsored Karen’s work on the project for the rest of that summer. The interactive map and website were built in 2007 with the final data entered in the summer of 2012. The first part of the project involved mapping all the data points in GIS; the second step was creating the animated map. As many scholars have noted, one major limit of GIS is how it handles change over time, a primary concern of historians and art historians. Because modes of mapping time in GIS were inadequate when this project launched in 2007, we chose to animate the map using Flash. Many members of Bowdoin’s Information Technology department contributed to the project at this stage. Israel conceived of the overall structure of the timeline, and designed and built the website within which the map is viewed. Tad Macy converted data into XML that could be consumed by the ActionScript to provide geographical coordinates, as well as gallery names, dates, and addresses, in the Flash multimedia platform for display on the website. He also revised and wrote new code in ActionScript to control the sliders on the map, and set the placement of map coordinates. Kevin Travers assembled the map’s interface as a timeline in Flash, which allows for the incremental animation of the data and overlays. And, finally, in 2012, Israel added information to each individual data point represented in the gallery layer of the map. As I worked with the data, a number of problems arose stemming from the fact that the database was created as a transcription of handwritten stock books. For the “artist” field, this problem was rectified when the database was created by validating the names against the Getty Provenance Index’s authority list of artist names, but the sales location field and patron field, for example, still contained multiple variants. With the consultation and support of UCLA PhD student Seth Erickson, a name authority for the sales location field was created and spelling of patrons’ names rectified. Digital scholarship requires an extensive time. Digital scholarship revises traditional publishing workflows: The content of digital projects is often inseparable from their formats and thus all options viable for the intended publisher must be considered at the outset of the project. Collaboration is crucial for success: Creating the conditions for scholars and experts in data management, database construction, programming and web design and development (to name just a few relevant domains) to come together as equals is critical to the intellectual success of digital projects. Rethink traditional models of authorship: In varying degrees, the processes of data standardization, interpretation, and visualization upon which these arguments are based were larger collaborative efforts involving many other contributors. The project narrative statement is thus an essential component of this publication, as it attributes and acknowledges the diverse contributions of our colleagues. Digital scholarship is a form of scholarly interpretation: The data-heavy aspect of digital projects may obscure the fact that this work rests on acts of interpretation distributed throughout the entire process, from deciphering nineteenth-century script to selecting, modeling, and presenting the data. At times our interpretation was shaped by computational and database requirements ill-suited to the ambiguity that often characterizes the primary source material used by humanists. For example, the data structure underlying the mapping project required a precise starting and ending date for each gallery’s tenure at a given address, but sometimes the archive does not provide definitive clarity on such information. The database underlying the network visualizations required a uniform name for each sales location for the purposes of clustering the data, but the archive used multiple nomenclatures. Both the methods and results of digital humanities projects should be understood as scholarly interpretations, and thus of a piece with long-standing practices in the humanities. Reconsider traditional models of scholarly argument: Our argument in the article is not limited to the text, but is also embedded in the map and visualizations. 2. These studies range from Dianne Sachko Macleod’s pioneering study of patronage, Art and the Victorian Middle Class: Money and the Making of Cultural Identity (1996), to the more recent investigations of Thomas M. Bayer and John R. Page, The Development of the Art Market in England: Money as Muse, 1730–1900 (2011) and the authors in our anthology, The Rise of the Modern Art Market in London, 1850–1939 (2011). 4. These scholarly arguments based on the map were also published in traditional print formats, for example: Pamela Fletcher, “The Grand Tour on Bond Street: Cosmopolitanism and the Commercial Art Gallery in Victorian London,” Visual Culture in Britain 12 no. 2 (July 2011): 139–152; and “Shopping for Art: The Rise of the Commercial Art Gallery, 1850s–1890s,” in The Rise of the Modern Art Market in London, 1850–1939, ed. Pamela Fletcher and Anne Helmreich. Manchester and New York: Manchester University Press, 2011. 47–64. 5. See the essay by Cuadra and Penot in this volume on preparing the Goupil & Cie/Boussod, Valadon & Cie database that is publicly available via the Getty Research Institute. 6. Franco Moretti, “Conjectures on World Literature,” New Left Review 1 (January–February 2000), 61. 7. In deriving these lessons learned, we closely followed the model of the Interim Report of the Online Scholarly Catalogue Initiative of the Getty Foundation: http://www.getty.edu/foundation/initiatives/current/osci/osci_report.html. 8. Christian Huemer, (Project for the Study of Collecting and Provenance, GRI), planned and supervised the production of the database. Ruth Cuadra, (Application Systems Analyst, GRI), was responsible for structuring the database and its web interface; independent scholar Agnes Penot transcribed the stock-book information. 9. For a fuller account of this process, please see the relevant section of “About this Project”: http://www.19thc-artworldwide.org/autumn12/fletcher-helmreich-mapping-the-london-art-market#about. 10. 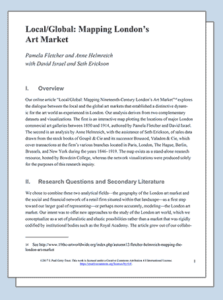 For a fuller account of this process, please see the relevant section of “About this Project”: http://www.19thc-artworldwide.org/autumn12/fletcher-helmreich-mapping-the-london-art-market#about.